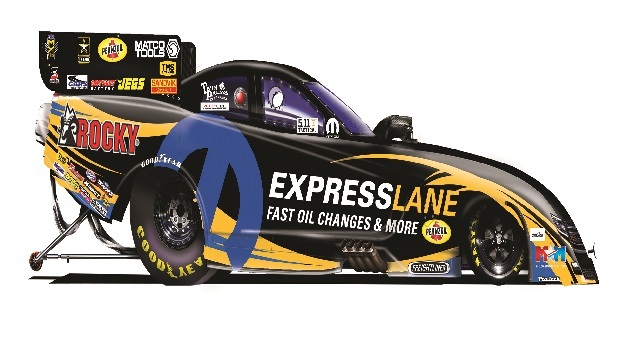 The Don Schumacher Racing teams confirmed they would continue in 2016 to drive the Mopar Dodge Charger RTs in NHRA’s nitro-burning Funny Car class, lengthening their long-standing deal in the fuel flopper class. Introducing the sleek Charger Body with greater driver visibility had immediate success with the results on the track seeing Matt Hagan, Jack Beckman, Ron Capps and Tommy Johnson, Jr. taking the Dodge to the final round in all but one of the 24 events of the 2015 season. Impressively going for the title, from second to fifth were all DSR Funny Cars with Beckman coming up 56 points shy of Del Worsham for the World Championship, followed by Johnson, Capps, and the quickest Funny Car ever of 3.879 seconds at Brainerd driven by Matt Hagan topping off the top five. Beckman dominated at Indy Labor Day weekend by doubling up with prestigious wins in the Traxxas Shootout and coming back the next day winning the one race every drag racer wants – U.S. Nationals. Car owner Don Shumacher, himself, campaigned in 1970 through 1973 the famous Stardust Dodge Charger and the ‘Wonder Wagon’ Plymouth Barracuda in building one of the strongest race organizations of all-time in any form of motorsports, winning 14 NHRA World Championships with 246 team victories. The DSR team will put fire in the pipes in 2016 starting with the NHRA Winternationals on Feburary 11-14 at the Auto Club Raceway at Pomona, California.